This week we’re lucky to be featuring a guest post by author and historical fiction blogger M.K. Tod of A Writer of History. 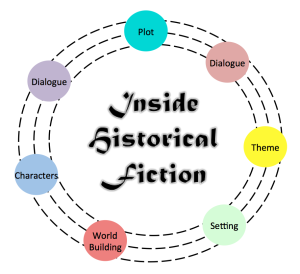 Mary provides valuable insights into the particular research required of the historical fiction writer, along with practical advice for sourcing the factual material that will help bring a bygone era to life in your novel. One way to examine fiction, either as writer or reader, is to consider seven critical elements: character, dialogue, setting, theme, plot, conflict, and world building. Every story succeeds or disappoints on the basis of these elements; however, historical fiction has the added challenge of bringing the past to life within each element. Research is key. What are readers looking for? Where do you start? 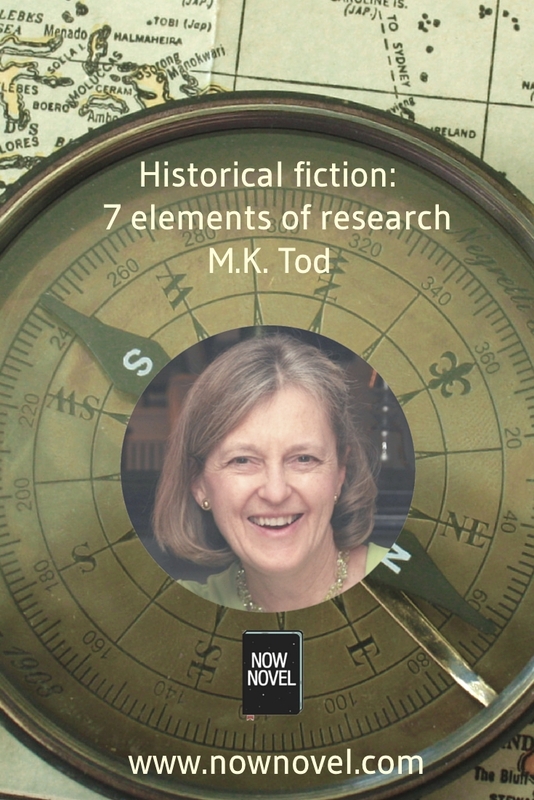 Below is an explanation of the seven elements of research in the context of historical fiction followed by a series of tips on researching material for your historical novel. Character – whether real or imagined, characters behave in keeping with the era they inhabit, even if they push the boundaries. And that means discovering the norms, attitudes, beliefs and expectations of their time and station in life. A Roman slave differs from a Roman centurion, as does an innkeeper from an aristocrat in the 18th century. Your mission as writer is to find sources that will reveal the people of the past. Dialogue – dialogue that is cumbersome and difficult to understand detracts from readers’ enjoyment of historical fiction. Dip occasionally into the vocabulary and grammatical structures of the past by inserting select words and phrases so that a reader knows s/he is in another time period without weighing down the manuscript and slowing the reader’s pace. Be careful, as many words have changed their meanings over time and could be misinterpreted. 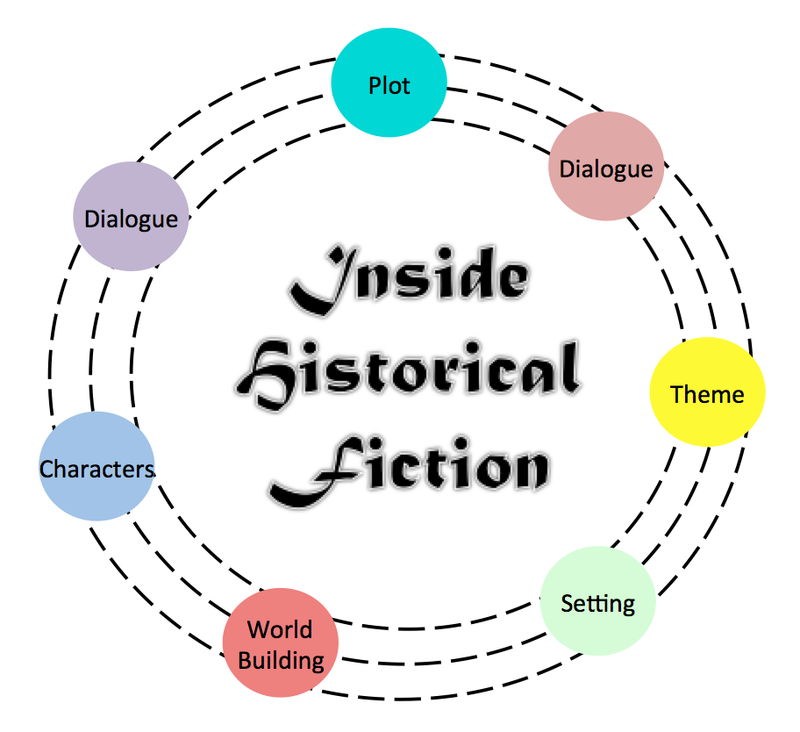 Theme – most themes transcend history, yet theme must still be interpreted within the context of a novel’s time period. Myfanwy Cook’s book Historical Fiction Writing: A Practical Guide and Toolkit contains a long list of typical themes: “Ambition, madness, loyalty, deception, revenge, all is not what it appears to be, love, temptation, guilt, power, fate/destiny, heroism, hope, coming of age, death, loss, friendship, patriotism.” What is loyalty in 5th century China? How does coming of age change from the perspective of ancient Egypt to that of the early twentieth century? Plot – the plot has to make sense for the time period. And plot will often be shaped around or by the historical events taking place at that time. This is particularly true when writing about a famous historical figure. When considering such historical events, remember that you are telling a story not writing history. Conflict – the problems faced by the characters in your story. As with theme and plot, conflict must be realistic for the chosen time and place. Readers will want to understand the reasons for the conflicts you present. An unmarried woman in the 15th century might be forced into marriage with a difficult man or the taking of religious vows. Both choices may lead to conflict. “And where do I find all that?” you ask. Read memoirs, literature written in your time period, old songs, sermons, out-of-print books, diaries and letters. These provide information on all elements: attitudes, language and idiom, household matters, material culture, everyday life, historical timelines, diversions, regulations, vehicles, travel, meals, manners and mannerisms, beliefs, morality and so on. Project Gutenberg and Fullbooks offer interesting selections of out-of-print books. Make sure you cover primary sources. As Elizabeth Chadwick says: “The primary sources will give you an idea of the mindset of the time – the thoughts behind the world in which your characters live – politics, social attitudes.” They illuminate your historical backdrop including wars, revolutions, major events, prominent people, and the news of the day. Find primary sources online, in libraries and in archives. Secondary sources include non-fiction accounts, biographies, academic papers, interviews with historians and experts. These too add understanding to the world of the past. Local sources, local historians and newspapers allow you to capture localities and neighbourhoods, to understand how much things cost, how long travel took, how international events affected local citizens, the things people worried and gossiped about, politics and scandals of the day. Old maps situate the streets and buildings of your setting and help ensure accuracy in your story. Remember, a street or building from long ago may no longer exist. What was once a footpath may now be a major roadway. For example, I consulted maps showing WWI trench locations to add authenticity to two novels, Unravelled and Lies Told in Silence. Personal travel offers a feel for the landscape your characters inhabit. Such personal physical connection is compelling. If that’s not possible, guidebooks and tools like Google maps and Internet photo searches are virtual ways to travel. Remember the land changes with time, so check your facts. Paintings give perspectives on clothing, class differentiation, social preoccupations, physical geography, architecture and other matters. Financial accounts help you understand what things cost. Transcripts of old court cases provide interesting ideas to enhance your plot, while also providing insights into the legal system and laws of the time. Weather records enhance the accuracy of your story with details about floods, extremes of hot or cold, monster storms. Museums are incredible sources of information and there are museums for just about anything. Even if you cannot personally visit a museum, some offer online exhibits, research papers, and search capabilities. Military records and museums are a rich trove of details. Newsreels are more relevant to historical fiction set in the 20th century. Movies about historical figures and times are a wonderful way to see and hear history. Most are carefully researched and offer ideas on fashion, morality, diversions, travel, politics, war, and home life, as well as the sounds of chariots racing, cannons exploding, the guillotine dropping. Be sure to check their accuracy. If you are writing about more recent times, vintage magazines, postcards, cookbooks, and brochures can also be useful. I would be remiss if I did not mention the internet. I have purposely listed this source last, however, as I would encourage you to use it in conjunction with all of the sources mentioned above or as a means to access these sources. A final word of advice: don’t forget that the purpose of research is to immerse yourself in the past, not overwhelm your readers with copious and irrelevant detail. Dig deep, but incorporate sparingly. M.K. 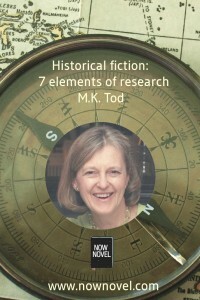 Tod writes historical fiction and blogs about all aspects of the genre at A Writer of History. Her latest novel, LIES TOLD IN SILENCE is set in WWI France and is available from all major online retailers. Her debut novel, UNRAVELLED: Two wars. Two affairs. One marriage. is also available from these retailers. Mary can be contacted on Facebook, Twitter and Goodreads.